So the controlled grazing isn’t really working. I’m blaming the weather. Its been like thunderstorm central around here, every day predicted chance of thunderstorms and when the pressure drops my horse likes to go nuts. Ive been taking her in the round pen where its a smaller enclosed space for her to graze. 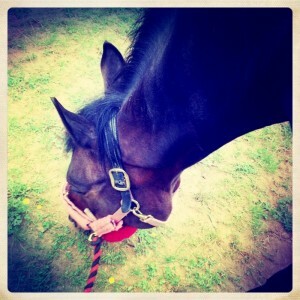 I have her at the end of my lead and i do use the whole racehorse chain over her nose thing. In out last trip in the round pen for a graze it didn’t take long before she was all four feet off the ground. I was able to get her back but man oh man it wasn’t easy to calm her down. Then she decided that pulling back to break away from me was a good idea. That plan got foiled. I let her graze for a few more minutes until she was calm and then… back in the box. Its not worth the fight, or the possible injury to fight with her like this when all signs point to her being more difficult then normal. Today I’m going to ACE her for the graze and see if that helps at all, or maybe i;ll do it tomorrow. I’m patiently wanting for the sun to come out to increase our odds of success. The weather gods say its gonna get sunny so i wait. True they’ve been wrong a lot this last week, but i do better with a plan. That’s my plan. At the end of this month shes due for her next ultrasound and I’m crossing my 9 working fingers that there will be enough improvement for some limited turn out in the round pen. I don’t care if i have to drug her to high heaven and sit and watch her for hours. I bought a folding chair, i have a laptop, and books I’m ready to do it. She needs out of the box, and even if it makes our recovery a little longer time wise i think in the long run it will be better for her mental health. The injury will heal well this i know. It minor and shes already responding better then expected. I want her mental health to improve too. 2 months in the box is making my pony unhappy and me guilty for putting her there. I also go back to my orthopedist tomorrow for a follow up which i know wont be great news. My range of motion is crap and i know hes gonna send me to physical therapy which i can not afford right now with all the other accident related bills and horsey vet bills. I’ll have to find a way cuz i want my finger back, i want my hand back i want things to go back to normal already.